Interesting point about turning justice points into old epic gems. I hadn't thought of that! About your ore purchasing. I see you have a massive preference for elementium. Is it because of the balance of rare and uncommon gems you get? Yeah, that's exactly why. If they cost the same I choose the ore that has a higher chance at rare gems. I don't transmute the common gems besides inferno rubies, and crafting the necks/rings to DE its a laborious task, and takes more time. As you can see I make a decent amount off of Demonseyes and Ember Topaz, so for me it's worth it to get more rares per prospect. 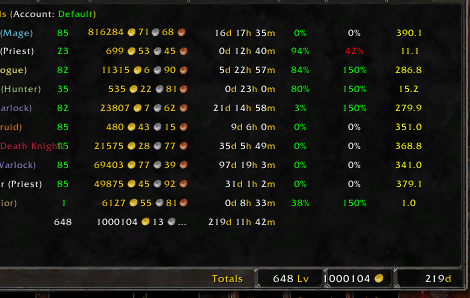 The less time I spend prospecting to get the rares I need the better!